Whether it's Hank Williams telling what it's like to be lonesome, or Barbara Fairchild lamenting the inevitable estrangement between a mother and her teenage daughter, or Bill Anderson comparing the squalor of big-city neon to the natural beauty of the stars, there is a potency about country music and more people are coming to appreciate. The worst of it is awful, but the best of it reveals a great deal about us (sometimes more than we want to know). 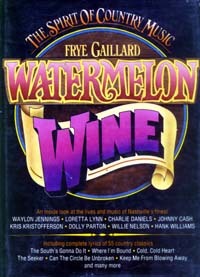 Watermelon Wine looks at the depth of compassion in today's country music and reflects a preoccupation with the past—with roots, traditions, and things that are old— that is unique to country music. For Frye Gaillard, this preoccupation has remained largely intact as the music has changed to meet the demands of a larger audience. For even today's country artists—performers like Waylon Jennings, Willie Nelson and Kris Kristofferson, who are profiled sensitively throughout this book—creativity lies largely in finding new leases for old-style influences. The tension between the old and the new, between tradition and change, is a central reality in the lives of the fans. It was inevitable that this would have an effect on the music, because, in Gaillard's view, the country sound has always served a function beyond entertainment. It's not simply a source of escape, but rather a means of coping, a relentlessly honest re-reflection of whatever emotion grips the songwriter. About the Author Frye Gaillard has been managing editor of the award-wining Race Relations Reporter, staff writer for the AP, correspondent for New Times, and free-lance writer. He is now entertainment writer for Knight Newspapers and the Charlotte Observer.